From its birth in an anonymous, academic style paper to one of the world's most volatile and closely watched financial instruments, bitcoin has lived through a tumultuous first 10 years. Here is a look back at some of the trials and tribulations of the world's most popular virtual currency as it stands on the brink of either mass market acceptance—or early retirement. Published on October 31, 2008 by a person or group writing under the pseudonym Satoshi Nakamoto, the currency was introduced to an unsuspecting world in a nine-page paper called "Bitcoin: A Peer-to-Peer Electronic Cash System". Nakamoto's objective: to create a system that can send payments "directly from one party to another without going through a financial institution". It was, in effect, a master plan for a global currency that could not be controlled by any central bank and could be accessed by anyone. The first 50 bitcoins were born at 1815 GMT on January 3, 2009. These were bunched into a single unit called a block, the first of which was appropriately called the "genesis block". From then on, every new block was attached to the one that came before it, creating what is today commonly known as a block chain. The first transaction between two accounts occurred nine days later, when Satoshi Nakamoto sent 10 bitcoins to computer scientist Hal Finney as a test. Bitcoin's first value was deduced on October 5, 2009 from its cost of production. At the time, the best way to get bitcoins was to "mine" them—essentially, use computers to solve difficult puzzles that release bitcoins from a block. The electricity costs—these operations involve massive banks of interconnected processors—were offset by bitcoin's real-world value. The puzzles get more difficult with the rise in the number of users, making their mining progressively more expensive. On May 22, 2010, a virtual currency developer in Florida named Laszlo Hanyecz got a pizza delivery man to accept 10,000 bitcoins for two pizzas. It was the first known bitcoin payment, worth about $41 at the time. Today, each of those pizzas would be worth in excess of $30 million (26 million euros) in bitcoin. May 22 is now known as "Bitcoin Pizza Day". Nakamoto announced his, her or their withdrawal from the project on December 12, 2010, ceasing all bitcoin operations four months later. The identity and number of bitcoins owned by Nakamoto has remained a mystery since. Nakamoto briefly reappeared in an internet chat room in 2014, denying a Newsweek magazine article that claimed to unmask the creator's identity. After malfunctioning for over two weeks, the main bitcoin exchange—based in Tokyo and known as Mt. Gox—filed for bankruptcy protection in February 2014. Accounting for nearly 80 percent of all bitcoin operations, the exchange said it had been hacked, losing some $477 million in crypto currencies. Its former chief, a Frenchman name Mark Karpeles, is still facing legal proceedings in Tokyo, where he was briefly placed under arrest. Karpeles has pleaded not guilty to embezzlement and data manipulation charges. Last year was a mercurial one for bitcoin, with the currency hitting glboal headlines after soaring in value from less than $1,000 in January to $19,511 on December 18—its all-time high, according to Bloomberg data. The virtual bubble burst in the subsequent days, with bitcoin's value fluctuating wildly over the course of the following weeks. 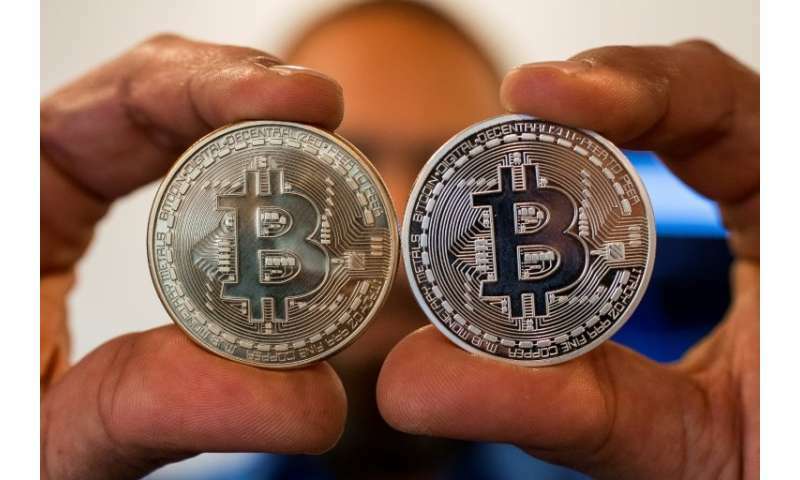 It is now worth about a third of its record value and is experiencing much more modest trade volumes and price swings, which analysts see as either a sign of maturity or the beginning of bitcoin's end. Bitcoin hopes its next breakthrough will come with approval by the US Securities and Exchange Commission (SEC) of its own exchange-traded fund (ETF)—a security similar to a stock that would track bitcoin's value. ETFs are one of the most popular trading mechanisms and the SEC's green light would give bitcoin a massive boost, securing both its short-term future and reputation among giant investment funds. The SEC is currently reviewing several applications. It has balked so far, expressing concern about the risk of fraud.